Hand pumps are great and all, but all that elbow grease just seems like an unnecessary convenience, while relying exclusively on air canisters can get costly after a while. If you’re looking for a more cost-effective and convenient way to pump some air to your bike tires, you may want to check out the miniFumpa. The miniFumpa is a pint-sized product that combines practicality and convenience. Providing a maximum pressure of 120psi, the electric bike pump does the job of providing relief for cyclists, and at a size of only 32x56x68mm, it has the ability to provide up to 120psi in 40-50 seconds for a 700x23c tire. The pocket-sized pump also comes with a micro-USB charger and push-on nozzle (which only works with Presta valves). The little devices are not miniature car batteries. 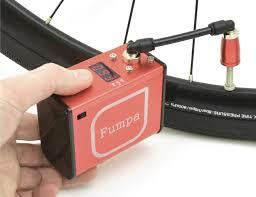 The miniFumpa is a portable air pump and charger. Each unit weighs only 180 gram and comes with 216 gram Carbon-dioxide cartridges. It quickly compresses surrounding air which helps the tier fill up faster. The pump delivers a maximum pressure of 120 PSI. There is even a digital pressure sensor that provides updated pressure readings. It is in the size of 1.3×2.2×2.7 in. (32x56x68mm) and weighs as 6.7 ounces (190 grams). It Inflates 2 tyres on a single charge and accepts Presta valves only. It can be easily fitted into your jersey pocket and the U SB attached to it is rechargeable.